Meals were eaten in silence on Monkbarns towards the end, the little mate chewing grimly with a revolver at his side and the even grimmer Old Man ramrod straight at the head of the table. 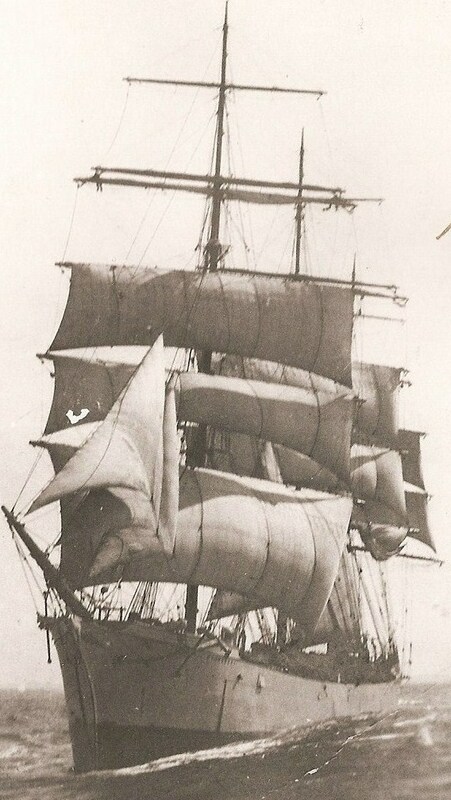 The old windjammer creaked and moaned around them and the oil lamp swung crazily overhead while the junior officers scraped their spoons, keen to escape back to the wind and the sails. They spoke when spoken to, which was seldom. Insubordination had begun before the crew even left Melbourne. The last eight men signed on were all older than the other hands, and outnumbered them. And when Monkbarns sailed on March 20th 1918 facing a winter passage round the Horn, they knew their rights. Within a week, bad weather compounded the ship’s troubles. 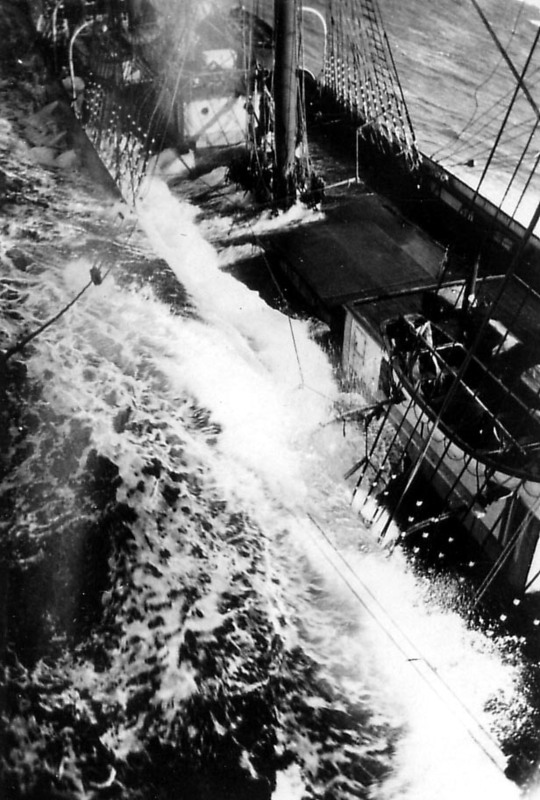 Huge waves swept the decks, swamping the bunks in the fo’c’sle and extinguishing the galley fire so the men could have neither cooked meals nor hot drinks. Ten days out, they were still beating across the Tasman Sea. When Captain Donaldson snapped sarcastically at Soren Theodor Sorensen for poor steering one day as he struggled to brace his sextant to take the noon sight, the Dane did the unthinkable and answered back. The offence was logged, but as word got back to the multinational crowd in the fo’c’sle that the only sanction available to Donaldson under British maritime law was a derisory five shilling fine, respect for the saloon nose-dived. Only drunkenness merited a 10 shilling fine, and then only for a second offence. For all other infractions the ship’s papers stipulated a penalty of five shillings, unless “otherwise dealt with” by law. 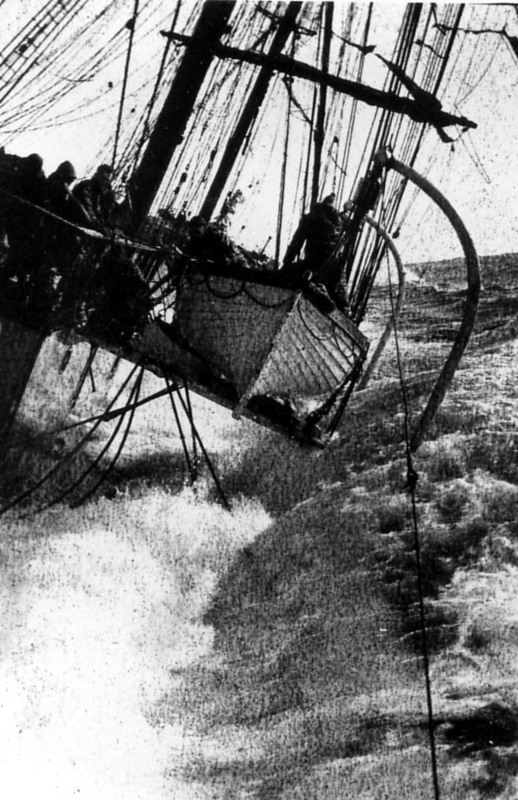 When the order next came to replace sails destroyed in the gale, the crew did not rush. Day struggled into day with the winds wailing around them and no land in sight. Weeks became months, and the rough meals got rougher as levels in the casks and bins fell. In the mugs, the black liquid they called coffee quivered under the waves’ pounding. Down among the sodden bunks, the men began to mutter. The potatoes were black and uneatable, they said, and the peas were so hard it took a mallet to split them. They had no soft bread, and only flour and molasses in the place of porridge, while instead of butter they had margarine bought in Buenos Aires six months previously, which they spurned as “bear’s grease”. Eventually a deputation headed by the Irishman, Thomas O’Brien, went aft. What happened next is not beyond dispute. Captain Alfred George Course, the first editor of the British Cape Horner magazine, never sailed on Monkbarns, but he spent a lot of time in bars with men who did, recording their tales (and writing them up under the pen name Leigh Forebrace. His little joke.) Course wrote that Captain Donaldson’s mutinous crew invaded the poop during the second dog watch that May, threw the Old Man over his chart table and threatened to cut him to pieces, but – like several of the other lurid accounts he recorded – this was not produced in evidence at the naval court hearing that was held in Rio three months later. Certainly, the despised “bear’s grease” was taken aft and thrown at the feet of the master, but the men claimed Donaldson had stayed in his chart room and sent the 1st mate out with promises of more food. The mate did testify that after May 15th he took to carrying a loaded revolver around with him in his pocket whenever he went on deck, day or night. He was just turned 23, newly promoted and at 5ft 2ins a good head shorter than every other man and boy aboard. The mate in question was, by then, young Bertie Sivell. Poor Bert, it was to be a baptism of fire.